Eva Bartlett will be speaking in a series of Conference venues next week in the U.K. alongside several other prominent authors including Peter Ford (former UK Ambassador to Syria and Bahrain), Professor Peter Kuznick (Co-Author with Oliver Stone, Untold History of the United States), Adam Garrie, (Director, Eurasia Future), Ken Livingstone(Former Mayor of London), Rev Andrew Ashdown (Doctoral Research Student in ‘Christian-Muslim relations in Syria’), Catherine Shakdam (geopolitical analyst and writer) and more! Imperialism on Trial: This series of events being held in four cities in the United Kingdom (10-16 July) offers an alternative narrative on global politics and war, to that presented by the mainstream media. For details, scroll down to foot of this article. Last week (early June 2018) I wrote about what civilians from Ghouta told me regarding unverified claims of the Syrian Army attacking them with chemicals, but they also talked about crimes committed by terrorists and the White Helmets’ role. Although benignly dubbed“rebels” by corporate media, the Salafist terrorist group Jaysh al-Islam are not fighting for freedom or human rights in Syria, nor are the other terrorist groups who formerly ruled in eastern Ghouta. It was Jaysh al-Islam which imprisoned Syrian civilians in cages, using them as human shields against potential bombing, and Jaysh al-Islam was among the terrorist groups firing missiles and mortars onto civilians in Damascus, killing over 10,000. They, Faylaq al-Rahman, and the other terrorist factions occupying the region reigned with terror, beheading men and women and starving the people. 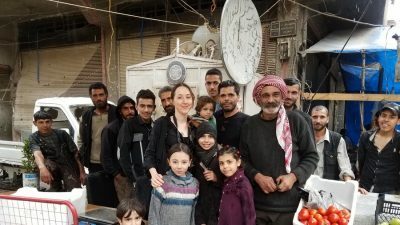 When I visited eastern Ghouta and the Horjilleh center for displaced people just south of Damascus—people mostly from Ghouta now—I asked about their lives under the rule of Jaysh al-Islam and others, including why they had been starving in the first place. The reply was, as I and others heard in eastern Aleppo, Madaya, and al-Waer, the terrorists stole aid and controlled all food, only selling food at extortionist prices which ordinary people could not afford. Sabah al-Mushref spoke of the callousness of terrorists in Hammouriyeh and Zamalka towards children and how her own children used to scavenge from the garbage of terrorist leaders who had ample food. When I spoke with Sabah, she was with three other people from eastern Ghouta areas. Their testimonies spilled out, each one worse as they spoke out loud of the horrors they had lived through. 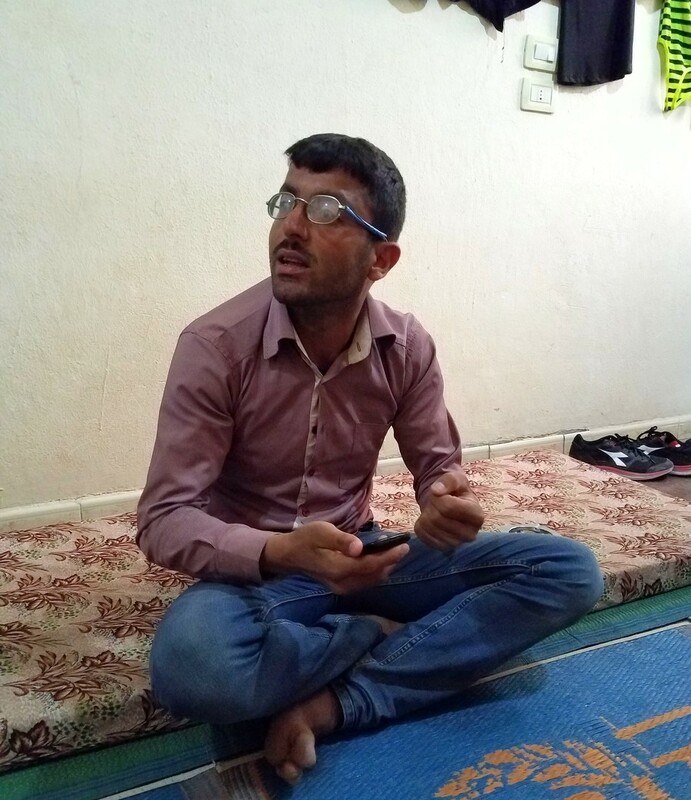 Mahmoud Souliman Khaled, 28, from Douma, spoke of his imprisonment and torture by Jaysh al-Islam. Khaled spoke of an execution he witnessed in Douma. A photo on his mobile phone showed a headless man sitting in a chair, no remnants of shelling. In Kafr Batna on May 2 this year, the streets were busy with normal life and the clean-up process, electricity workers restoring power to the town. Outside a shop selling shawarma, Mou’taz Al-Aghdar spoke of being imprisoned for 15 days by Jaysh al-Islam for selling rice. He spoke of the executions by sword, and of disappeared children and adults, some returned with organs missing. “We live in a small town, people started to talk: a child was kidnapped here, another one there… Some people were kidnapped and their organs were taken. A child was buried, he was found dead in a barn covered with straw, he was tied and covered with straw while he was still alive. 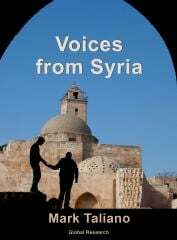 We didn’t know who did it.” Other civilians from Ghouta have spoken of organ theft. Further on, I encountered Mohammad Shakr, who pointed to the central roundabout and spoke of terrorists’ executions there. 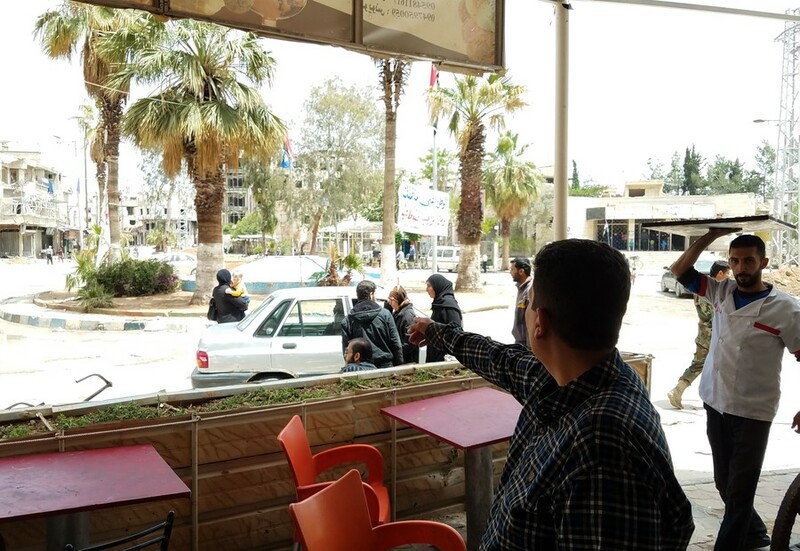 In an ice cream shop near the square, Abdallah Darbou also said he’d seen such executions. He also spoke of protests. 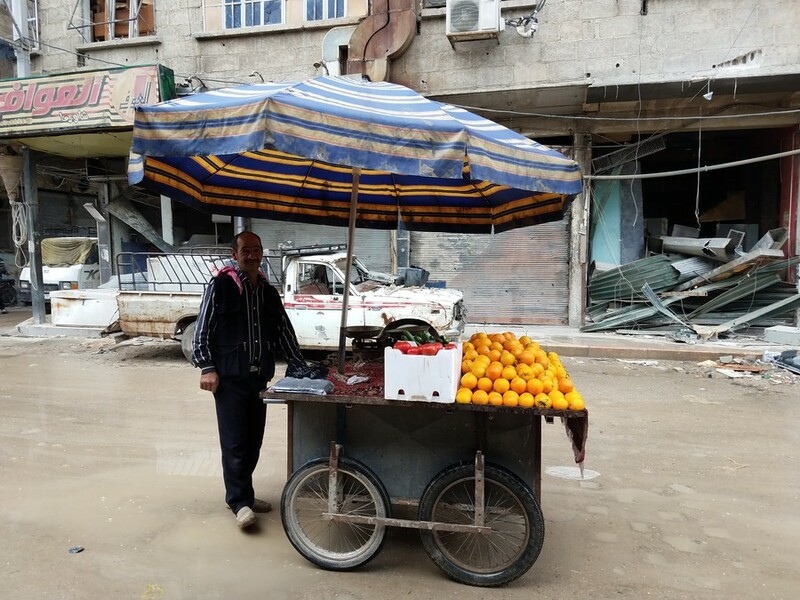 Men at a vegetable and fruit stand, who had replied with a resounding ‘no’ when I asked them about the chemical allegations, also spoke of the aid that was sent into Douma. An older man, exaggerating to make his point that there was ample food in Douma, said it was enough to last five years, but that the terrorists had deprived them of it. I asked about the agricultural fields I’d seen when entering Douma. The reply was that Jaysh al-Islam had control over everything, the fertile land, the livestock. A youth told me that before the terrorists left Douma on the buses, they shot all the animals. The men spoke of executions, making a throat-slitting gesture. A younger man recounted another murder, when the executioner put a pistol in someone’s mouth and pulled the trigger. “Terrorism, they are the literal meaning of terrorism,” Toufik Zahra, the stand owner, said. The young man in the ice cream shop, Abdallah, replied that he didn’t know anything about the White Helmets because he and civilians in general weren’t allowed to go near them. That in itself is strange, given their supposed focus is saving civilians, and given that the White Helmets had centers in Douma, Zamalka, and Saqba. The White Helmets center in Saqba was less than 500 meters away from Kafr Batna. Notably, it was also just 200 meters down a lane from a building where Faylaq al-Rahman manufactured vast amounts of missiles and mortars. 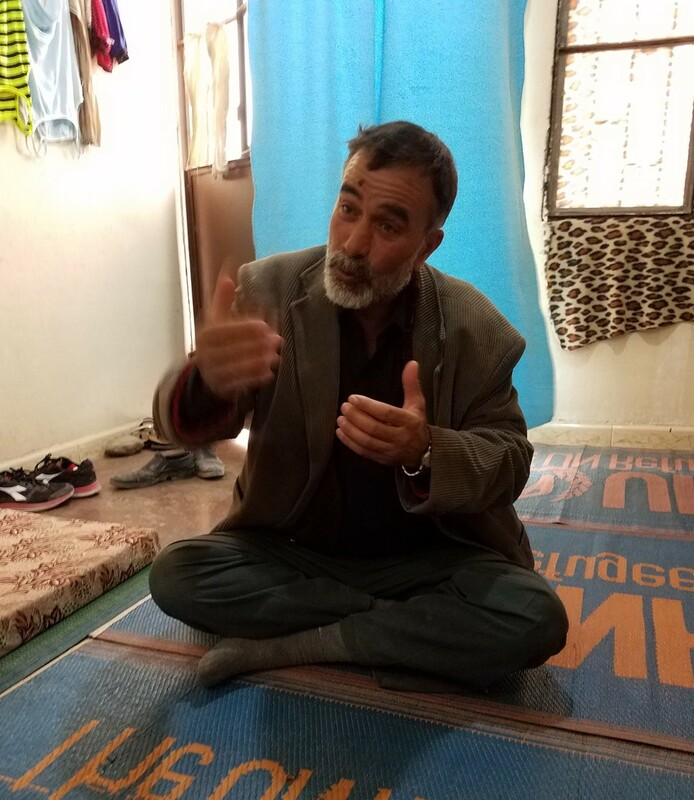 Marwan Qreisheh, in the Horjilleh center, had a lot to say about the White Helmets. “The first civil defense members who arrived to Ghouta three or four years ago came from foreign countries, they weren’t Arabs, didn’t speak Arabic. They were the terrorists’ defense, they used to terrorize. They had plenty of money and used it to attract people to join the civil defense. When the White Helmets wanted to go somewhere, terrorists used to go with them and open the roads for them. The moment they would arrive at a place where they wanted to fake an attack, they threw 10 smoke bombs, causing heavy smoke, you couldn’t see anything. They used to shoot people, and after the smoke cleared, they start filming. It was impossible to say a word because they would kill you, they would empty their gun on you immediately. Qreisheh’s claims about amputation were echoed by Hanadi Shakr, from Saqba, who worked for a year as a nurse until her husband, who had joined Jaysh al-Islam, forced her to quit. Claims of lack of medical supplies turned out to be false, as in eastern Aleppo. In an underground hospital in Saqba alone, I saw rooms full of medicines and stolen medical equipment. Syrian journalists documented such stores elsewhere in eastern Ghouta. When eastern Ghouta was being liberated, corporate media was busy churning out fake reports of massacres, just as corporate media did when Aleppo was being liberated. They produced stories emanating from supporters of terrorist factions, always blaming the Syrian government for starvation, and above all, whitewashing the crimes and terrorism of extremist groups occupying eastern Ghouta. In reality, Ghouta civilians had much to say about their captors’ crimes, and also about their relief at being liberated by the Syrian Army, but corporate media isn’t interested it doesn’t fit their regime-change narrative.